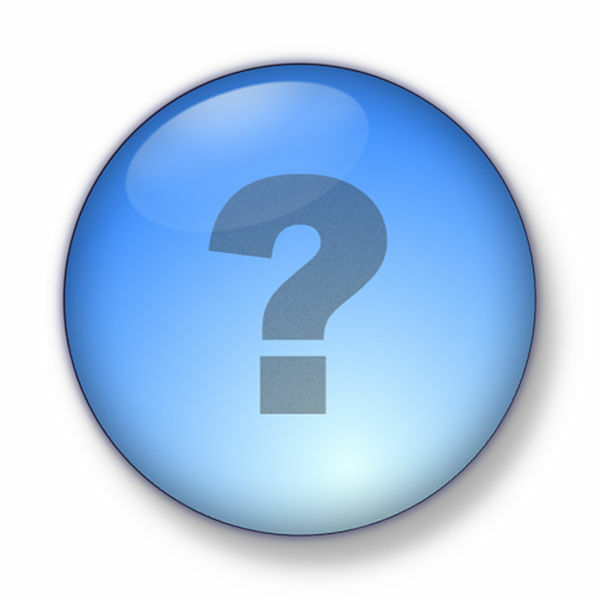 Thought for the day – and the cup is half…. On the one hand, I know I should feel concerned when I see all the unsold fruit and vegetables on offer for a quick sale at the end of their shelf-life in our local supermarket, which perhaps represents a dangerous shift in the nation’s eating habits away from fresh produce and towards less healthy options. On the other hand, however, I get a very real sense of satisfaction when I consider the large amount of money I save every month buying it…! This entry was posted in Rants musings and gibberish and tagged eating habits, paleo, thought for the day on July 31, 2014 by paleovirtus. Lentils and other pulses, so important in Indian cuisine, do not find a place at the Paleo table. In my pre-Paleo days, whenever I rustled up an Indian themed feast, lentils were almost certain to get a look-in, as were chick peas in some form or other, so this has been a major stumbling block on my Paleo adventure. Project Paleo Asian Redux is all about reversing these small setbacks, about finding alternatives to non-Paleo ingredients that do not detract from the original meal or dish’s merits. 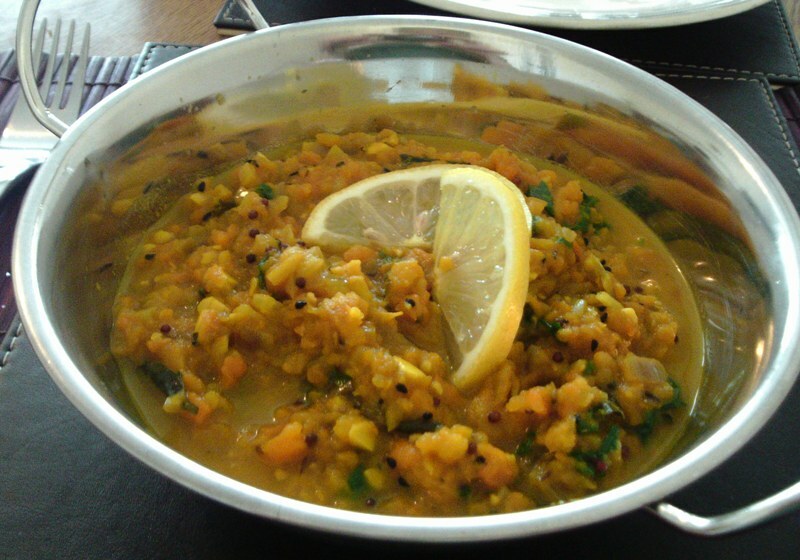 When it came to the lentil question, my thoughts turned initially to Masoor Dal, or red lentil curry. This is a curry where the red split lentils are cooked down into a purée. It was also a firm favourite of mine pre-Paleo – it’s a quick, simple, and incredibly cheap dish, one that falls into the “what’s not to like” category. After considering the problem for a while over a nice cup of green tea, I thought of using a purée composed of swede (rutabaga) and carrot – the texture should be similar, and it should also have that earthy, warming, taste. I could then add to the purée the old familiar spices that I would once have added to a lentil base. Serves 1 either as an accompaniment to a main course, or with some Paleo friendly bread as a light lunch or dinner. Prepare your swede and carrot. Peel and cut into about 1.5 cm dice. Cook for about 45 minutes, or until really tender. Drain thoroughly, and then mash well, to a smooth and lump-free purée. Meanwhile, heat about 2 tbsp coconut oil in a pan over medium heat. When the oil is hot enough so that a cumin seed instantly begins to sizzle when dropped in, add the seeds and curry leaves to the oil, and stir well for a minute or so, savouring the fantastic aroma already coming out of the pan. Add the onions, and fry for about 2 minutes. Add the ginger and chillies. fry for 2 minutes more. Add the garlic and turmeric powder. Fry for 2 minutes more. By this time you might need to add a splash of hot water to keep everything from sticking. Add enough hot water so that you get a nice sauce forming in the pan, just don’t make it overly runny at this stage. Simmer the sauce for about 15 minutes, adding more water as required. Add the swede and carrot purée to the pan, and stir well in. Continue to cook until the dish has the required consistency, and the swede and carrot purée is heated through. Stir in fresh coriander (cilantro) to taste before serving. If you do not actually like this blessed herb, then by the beard of the Great Shaman you have my deepest sympathy. When preparing the sauce you might want to replace the water with coconut milk. This entry was posted in Food Diary, Recipes and tagged curry, Indian, paleo, recipe, spicy root vegetable purée on July 31, 2014 by paleovirtus. Throw the red onion, chilli, tomatoes, olives, capers, and cucumber into a mixing bowl. Flake the tuna into the bowl. Mix everything well. dress with olive oil and lemon juice. Season with a twist of salt and a lot of black pepper. Mix well. Serve on a bed of salad leaves. 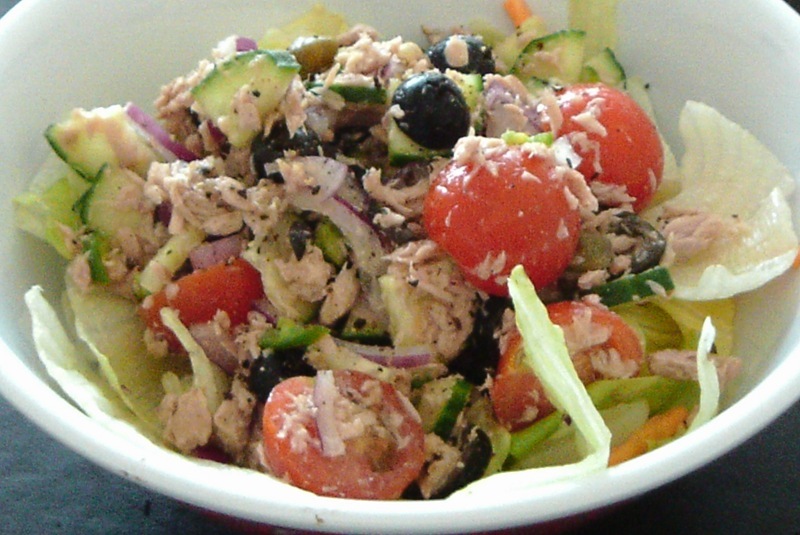 This entry was posted in Food Diary, Recipes and tagged paleo, quick, recipe, salad, tuna on July 30, 2014 by paleovirtus. During the working week, it’s always good to have a quick-fire dessert or two up your sleeve. Here’s one of my favourites. 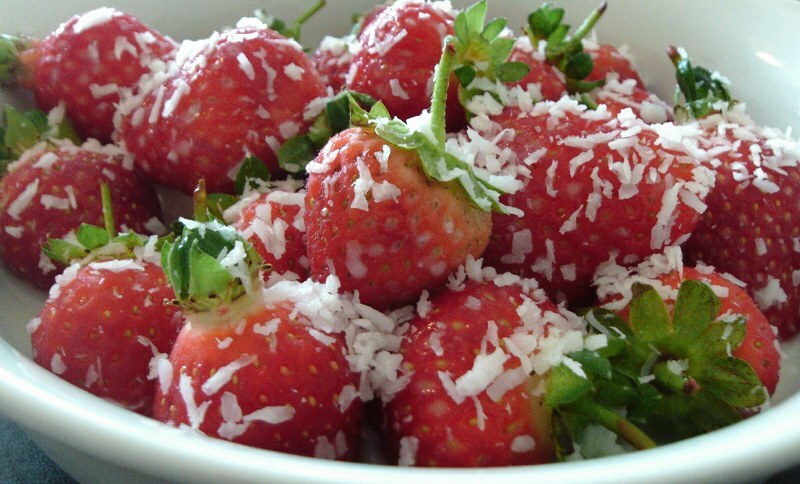 Simply rinse off a couple of good handfuls of strawberries, place in a bowl, slowly drizzle over just enough almond milk to moisten them somewhat, and then sprinkle over some dessicated coconut. If you can resist the urge to devour your work immediately, allow to sit in the fridge for 10 minutes or so to allow the flavours time to mix well. This entry was posted in Food Diary, Recipes and tagged almond milk, dessert, dessicated coconut, paleo, recipe, strawberries on July 30, 2014 by paleovirtus. The name of this dish makes use of the Hindi word “masala”, which refers to a mixture of spices. I know what you’re thinking…isn’t the population of India mostly vegetarian Hindus and Muslims for whom pork is forbidden..? An Indian pork dish? Once upon a time that surprised me too, but yes, there are some religious and ethic minorities in India who do eat pork. The original “vindaloo”, for example, is in fact a Goan pork dish (Goa remember was a Portuguese colony, with a large Christian population) – the original Portuguese name “Carne de vinha d’alhos ” means “meat with wine and garlic”! This is a variation of a recipe I found in a cookbook I bought way back in 1993, by Naomi Good, who was born in Mumbai. We are simply going to make a spicy marinade / rub, gently massage it into the cut of pork we happen to be cooking – here for example I was using a boneless loin steak, wait for a while to allow the flavours to penetrate the pork, infuse the flesh, as it were, and then cook as we would normally do so for that particular cut, which in this particular case meant pan frying for about 4 minutes a side. Serves 1, but scales up easily – just make enough marinade / rub for the amount of meat you want to cook. Combine the dry spices with enough olive oil and lemon juice to create a paste. Gently rub this in to both sides of the meat. 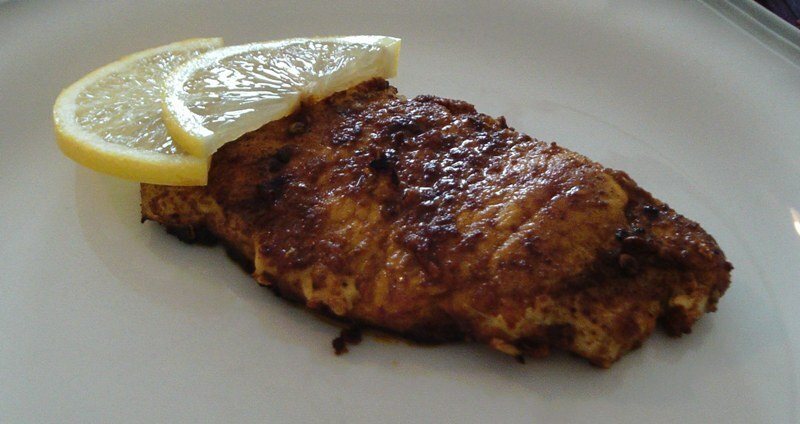 Cover and place in a refrigerator to marinade – a couple of hours should see you right. Before cooking, take out of the fridge and allow to return to room temperature. Heat a couple of tablespoons of coconut oil in a frying pan over medium heat. Add the pork, and fry as appropriate for that particular cut. Flip, and fry the second side. Remove from the pan when done. Allow the meat to rest for a few minutes before serving. Serve with lemon wedges, and the accompaniment / side dish of your choice. I went for my spicy root vegetable purée, but spicy stir-fried Indian cabbage would also work a treat. This entry was posted in Food Diary, Recipes and tagged curry, Indian, Masala, paleo, pork, recipe on July 30, 2014 by paleovirtus. This is a method of preparing pineapple I hadn’t tried before – I was inspired by Daniel Green’s book “The Paleo Diet – Food Your Body Is Designed To Eat”. This recipe works rather well as a quick and easy dessert that is going to follow a spicy main course. I chose to grill the pineapple minus the honey found in Daniel’s recipe – even though the honey would have helped to caramelise the pineapple, it probably would have made it too sweet for my taste. I didn’t have any honey in, either, which sort of helped make my mind up. The other change I made was to the garnish – instead of cinnamon and mint, I used shredded coconut and walnuts, because, again, I just happened to have them in! half a pineapple, peeled, and cut into slices about as thick as the tip of your little finger. Toss the pineapple slices in enough lemon juice to give them a good coating. Bring a grill-pan up to medium high heat on your stove top. Grill the slices until you get those wonderfully characteristic “char” lines – be careful not to let them burn. Flip and grill the second side. Flip again, rotating through 90°, to give that “checker board” cross-hatch pattern. Flip for the final time. Grill the slices until done. Plate up, and garnish with the shredded coconut and chopped walnuts. 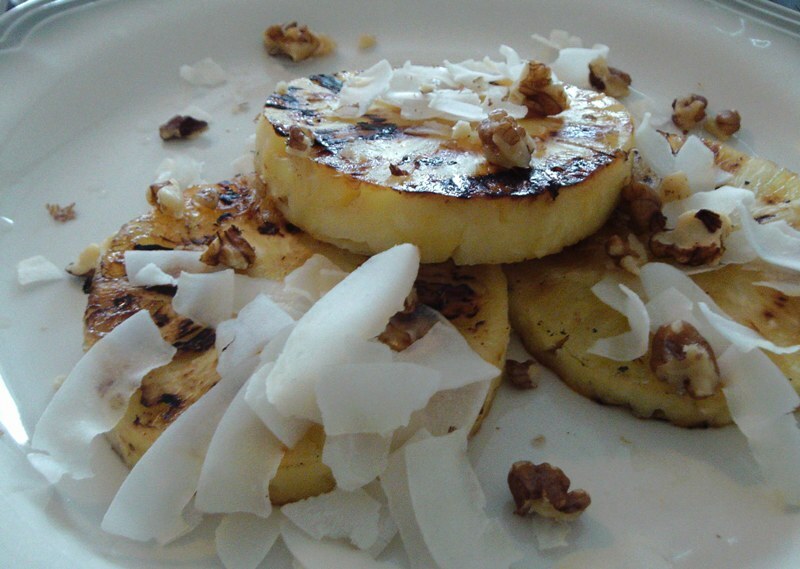 This entry was posted in Food Diary, Recipes and tagged dessert, grill pan, paleo, pineapple, recipe on July 29, 2014 by paleovirtus. A standard “Korma” style curry is usually made in a very un-Paleo friendly way – yoghurt and cow’s milk, cream, and butter figure prominently. A Paleo-friendly korma was therefore going to be one of the objectives and challenges for Project Paleo Asian Redux. I was encouraged by the fact that very often kormas will make use of ground nuts and coconut milk – perfect Paleo produce, and so a good starting point. My general approach turned out to be remarkably simple – I simply blitzed my onions, garlic, ginger, and chillies together as I would do if preparing a batch of my tomato based curry sauce, except with almond milk rather than water. After adding the same spices as for the base red sauce, the only difference thereafter between the two sauce types was that the korma used coconut milk and coconut cream. Makes a very generous serving for 1, with some sauce leftover. approx 200g chicken breast fillet, cut into bite sized pieces. Place the “wet” ingredients into a large mixing jug. Cover with almond milk. Using a hand blender, (or in a blender, if you have one) blitz down to a smooth mixture. Add the “dry” spices, season with a twist of sea salt and plenty of black pepper. Stir well. Allow to stand for 10 minutes to allow the mixture to thicken up somewhat. Transfer the sauce mixture to a large non-stick pan or casserole over medium heat, and simmer gently for about 10 minutes. Add the coconut cream, the coconut milk, and stir in well. Add enough hot water to give a thinnish sauce – you basically will want enough volume in the pan to cover the chicken while it’s cooking. Add the chicken and bring back up to a simmer. Simmer until almost done, about 12 minutes or so. Add the ground almonds – you want to add enough just to thicken the sauce up to a nice consistency, neither runny or overly thick. Cook until the sauce has thickened and the chicken is fully cooked, about another 3 minutes (15 in total for the chicken) should see you about right. Do check that the chicken is cooked through, though – it should be white inside when cut. Serve garnished with the chopped cashews, and possibly a little dessicated / shredded coconut. Enjoy with any Paleo friendly bread, or cauliflower rice. 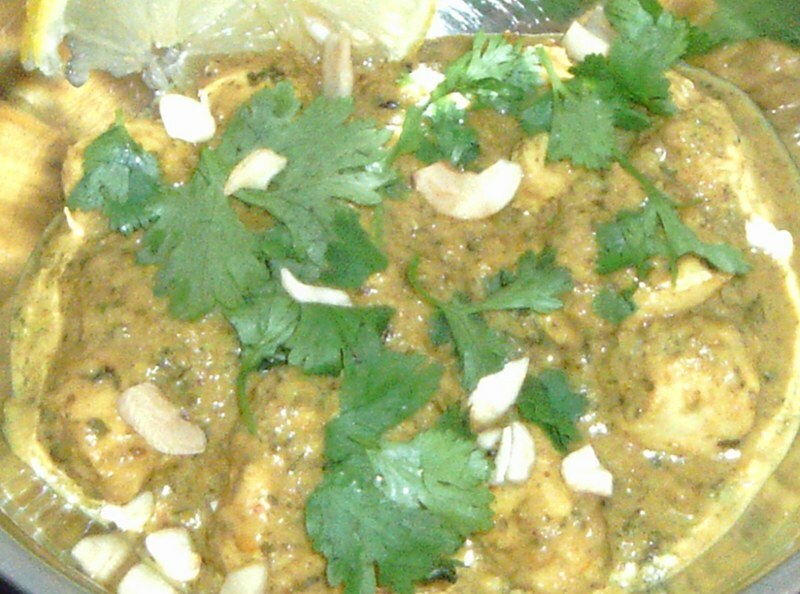 This entry was posted in Food Diary, Recipes and tagged almond, chicken korma, coconut, curry, Indian, paleo, recipe on July 28, 2014 by paleovirtus.